Happy Birthday Roy Lichtenstein | "A Place for Learning"
American artist Roy Lichtenstein was born in New York City on October 27, 1923, and grew up on Manhattan’s Upper West Side. 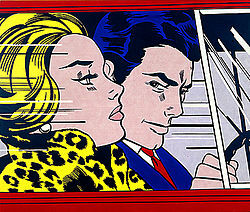 In the 1960s, Lichtenstein became a leading figure of the new Pop Art movement. Inspired by advertisements and comic strips, Lichtenstein’s bright, graphic works parodied American popular culture and the art world itself. He died in New York City on September 29, 1997. Read more about him here.